You know that feeling right? You’re searching for a calculator, but they all seem to have disappeared. Or you’re looking at a tiny little, rather boring black generic item. 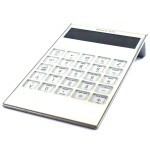 Wouldn’t it be fantastic if, every time someone reached for a calculator they were reminded of your brand? And how thoughtful you were in giving them a useful office gift? This stylish white desk calculator is solar powered, and has an ergonomic touch pad number pad. We can print your logo, name, slogan or company details onto the calculator, and also create custom packaging if you wish. Other custom printed office items that are also popular amongst purchasers of this custom printed desk calendar are custom printed pens, custom made stress balls and our custom printed miniature mouse.